We lost my mother suddenly July 19th and I have been in a state of shock since 6 o’clock that morning. Waves of grief have ebbed and flowed over numbness these last few weeks as my father, brother, sister and I have found ourselves in a world so foreign to us that we don’t know to navigate its customs nor speak its language. All that we know is that we miss our mother. We love her. And we hold onto each other tightly as we stand at the edge of the ebbing, the flowing, the rising of this tide until we swim again. 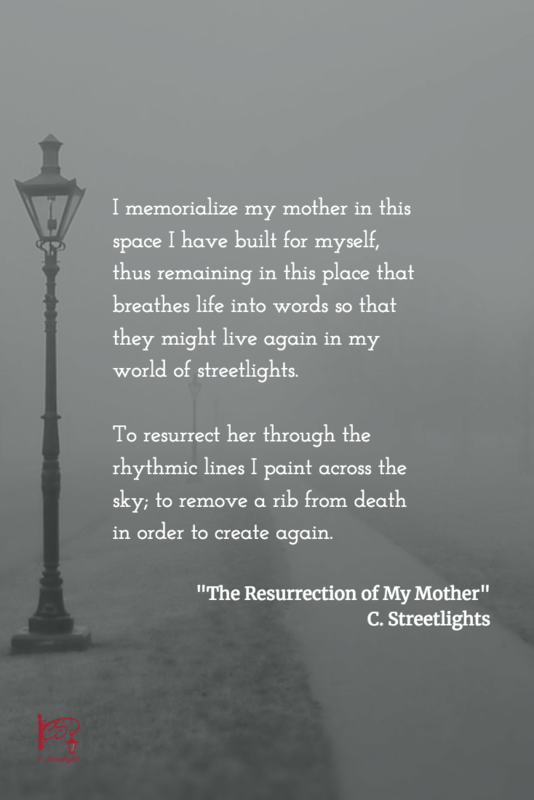 I memorialize my mother in this space I have built for myself, thus remaining in this place that breathes life into words so that they might live again in my world of streetlights. To resurrect her through the rhythmic lines I paint across the sky; to remove a rib from death in order to create again. 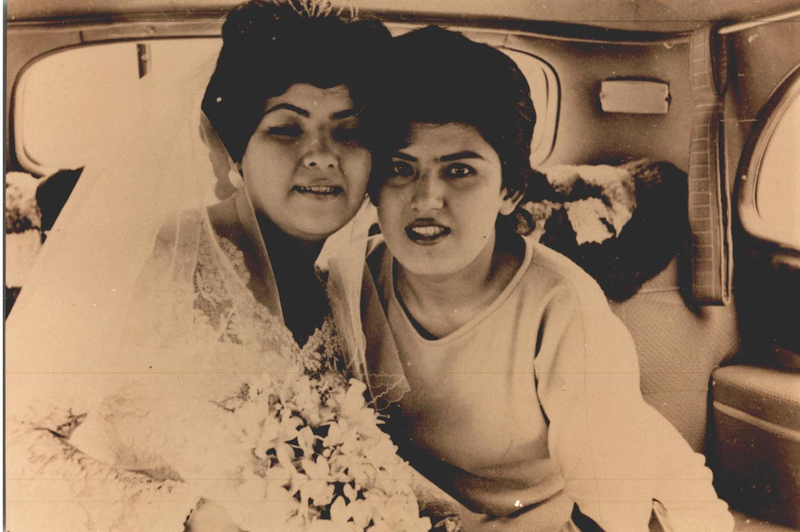 My mother (on the right) with her her sister on her sister’s wedding day. I want to remember sitting on the bathroom floor as a tiny girl, watching my mother use the lid of an old makeup tin from Peru to curl her eyelashes. She’d place her lashes between the edge of the tin and the tip of her thumb and press firmly, curling her lashes perfectly. Her makeup was always flawless, and while some might think this is frivolous, I know that makeup was more than just vanity to my mother. In a life that had its disappointments and humiliations, having flawless makeup helped my mother keep her pride. And she was beautiful. I want to remember how my mother protected me from myself as a little girl. I would wake up early in the morning to watch whatever channel could come in clearly on the television because I didn’t know how to adjust the antennae. Sometimes it was bowling. One morning I came to her in tears because a man was yelling at me about God. From that point on she made sure I never found televangelists on the television again. My grandchildren will learn what I learned from my mother’s grandmother, never second guessing the same remedies that I never second guessed because my mother said her grandmother was the wisest woman she ever knew. We will continue licking our fingers and making the mark of the holy cross on our ankle with our wet finger when our feet fall asleep and waiting patiently for pinches of sugar to melt on our tongues when we have the hiccups. Even to this day, I can close my eyes and smell my mother’s soft satin and pink night gown that I would sneak out of her dresser drawer just to smell. I am convinced that heaven would smell just like this night gown and hot glue drying on felt. Memories of our mother and our dining room table covered in crafting supplies where she would be hunched over with a hot glue gun and felt, or sequins and tole paint, overwhelm me. Whatever she was working on, my mother would be creating something never before seen that boutique season but would be replicated by hundreds of others the next. Somehow, our mom always had the pulse on crafting industry before other crafters could find the heartbeat. And I? I would be under the table, picking up lost pins, sequins or googley eyes. I learned early to lock away the stories she told me about her life in Peru and stash them away in my mind and heart. She didn’t talk much about her childhood, and when she did it was like sneaking a peek of pirate treasure. She would laugh every time she would tell me about the time her grandmother caught her rollerskating down the hallway. Sometimes she would me about the nuns at her Catholic school, and I wish I can remember their names now. I loved to see her smile when she would tell me about her favorite nun who jumped rope with her. And there was one time, only one time, when she told me about a friend who stuffed her bra with gym socks but was then caught by the nuns when they checked for multiple sclerosis one day. I spent many years as an only child; my older brother and sister were already either married or away for school and out of the house. It was always just my mom and me because my dad worked late. We often butted heads, which is only natural when you not only have a headstrong daughter, but you’re also alone with each other as much as we were. There were times when we really disagreed with each other, and it was usually over people. I hadn’t quite honed my ability to read a person’s character yet whereas my mother could take one look at a person and know if they made their bed that morning. She knew I was far too trusting of people and that I left my heart wide open for them to make themselves at home and steal the silverware. Like most everyone who has ever been a teenager, I wish I could go back and take back all the arguments we had when I was young. However, if there is one thing to know about arguing with anyone in my family, is that we are like a flare gun — we go off like one big pop and then everything is all over. But I can testify that there are times when there is resentment over the flare being used in the first place. The residue of it hangs sticky in the air and the smell never goes away. Don’t let a flare go off when just turning on a light switch will do. My mother left us suddenly and we are lost still. This foreign world continues its relentless insistence that we learn the language and adapt to its customs, but we stumble as if in the dark. Grief does not employ ambassadors. The tide continues to rise. The water grows deeper. My father, brother and sister and I… we will survive. We do have my mother’s glue gun, after all.